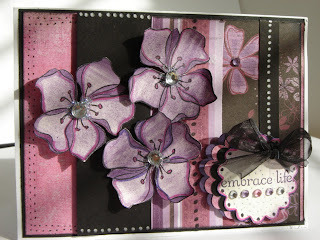 Cards by America: Embrace Life! This was a completely different card of mine that I took apart and redid/re-engineered. I seem to do that a lot when Im not happy with a result. Here, the colors seemed to blend well. Now this is GORGEOUS! I really love the beautiful curled flowers and the rhinestones. I love how you add the pretty blings to your cards!